Four men use timber jacks to shift a huge log. 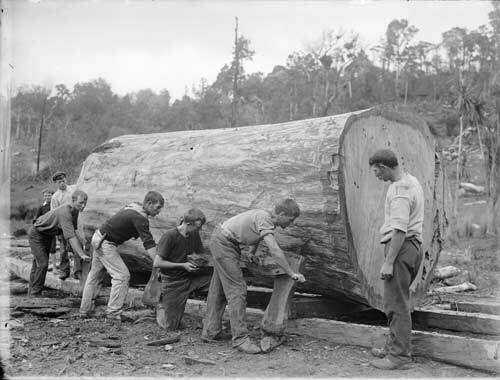 The timber jack was a New Zealand adaptation of the screw jack, and was widely used in the bush when other methods of moving logs were unavailable. The jack had a spear-shaped bar fitted into a stock, which contained a ratchet operated by a system of cogs. Turning a handle moved the bar up or down. One end of the jack was held on the ground, while the spear end of the bar was fitted under the log. The handle was then turned clockwise to move the bar up and roll the log sideways.